Februarty has been a somewhat quieter month campaign-wise and unlike last year it did not end with snow. 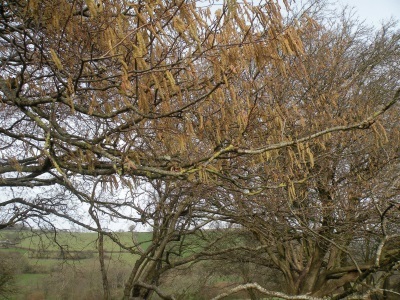 It looks likely now that this will be a snow-free year as far as Manning's Pit is concerned but we have had some beautiful frosty morning over the winter, and can now look forward to spring as the splendid show of hazel catkins in the fields demonstrates. 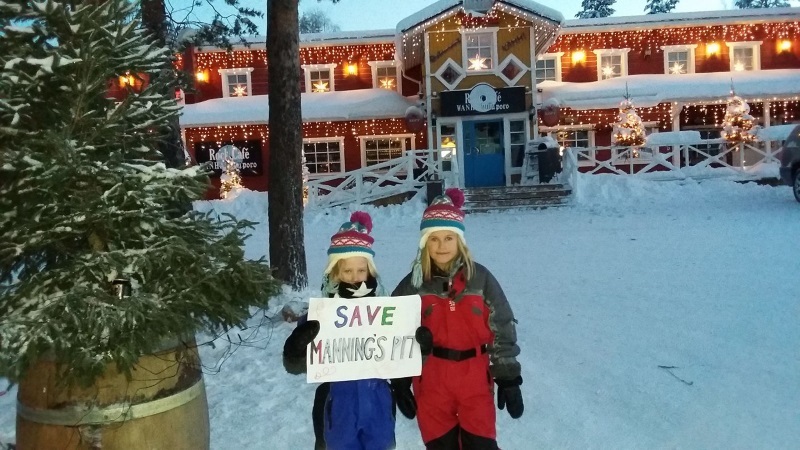 February is Panto month, and this year's performance was a special one, with many Manning's Pit supporters playing important roles, both on stage and back-stage. 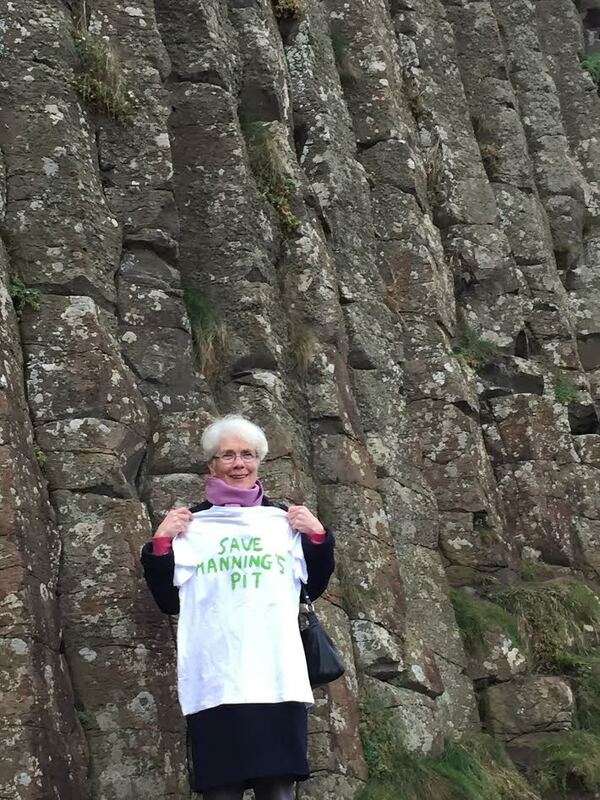 Manning's Pit was mentioned more than once and this time rather than the banner, a Save Manning's Pit T shirt made an appearance. 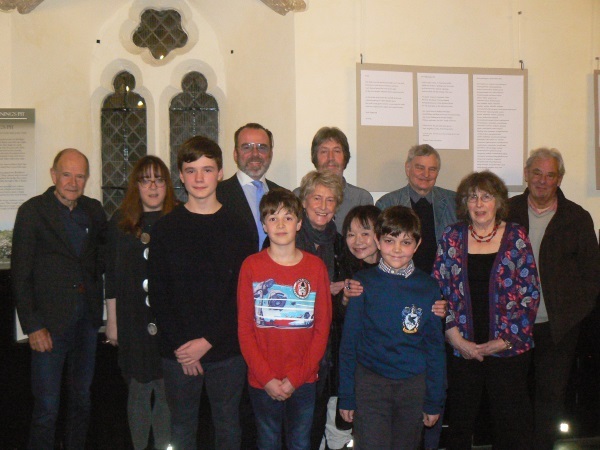 The Presentation evening for the Poetry Competition was held at St.Anne's Chapel in Barnstaple, a small but very attractive venue which is run by The Plough Arts Centre. Our campaign has a link with this building though the artist F R Lee - there is a plaque on the outside of the chapel in memory of his brother, the architect Thomas Lee who died while swimming - or possibly surf-boarding - at Mortehoe. You can read a full report of the occasion which was a great success on this page, along with videos of the prizegiving and many of the winners reading their poems. We would like to give special thanks to Julia Bird, our Judge, who came down for the occasion and David Weeks (Executive Director of The Week Magazine) who gave out the prizes. The event was also attended by the Mayor (who had to leave early and it not therefore in the photographs) and Brian Norman, whose poem The Battle of Manning's Pit gave us the initial idea for the competition. 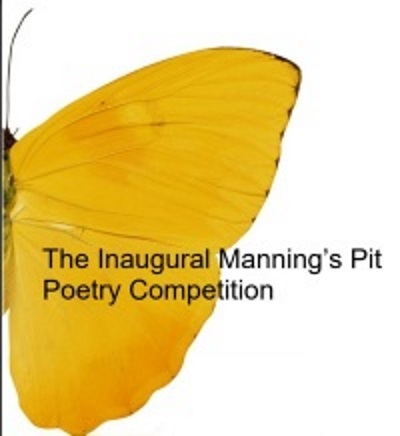 The Results of the Inaugural Manning's Pit Poetry Competition were announced on December 30th. The first prize in the Adult section went to Mark Totterdell from Exeter, who is already an established prize winning poet and was the Judge for the Exmoor Society Dark Skies Poetry Competiion. Second was Frances Corkey Thompson from Ilfracombe and third Mark Haworth-Booth from Swimbridge. 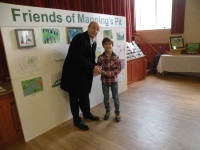 The prize winner in 12-18 Category was Ryan Vowells, who lives in Pilton, close to Manning's Pit. 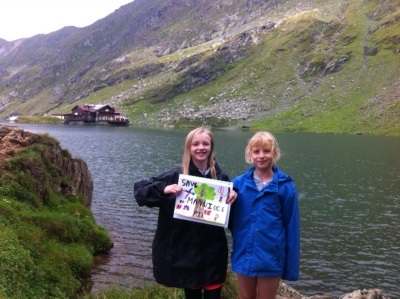 Second and third prizes went to Holly Cooke and Lily Gentry from Filton College in Glos. The Under 12 prize went to two boys who wrote their poem together, Theo and Toby Lawrence. They live in the house that was once called Broadgate Villa, where Saki grew up, and they love Manning's Pit just as he must have done. Second was Vincent Burton from West Buckland School and third was Alex Meller, who lives in Pilton. We are thrilled with the response we have had from both the local community and further afield, with entries from the North of England and Scotland and international entries too, most notably from India, as noted earlier. Meanwhile, December was a quietish month, giving us time to take stock of our achievements so far, and have thoughts about the future. We have a number of projects already in mind, the most exciting of which is an Exhibition in Pilton Parish Hall that will take place over the Festival weekend in July. This Exhibition will focus on the environmental and ecological aspects of Manning's Pit and the Bradiford Valley, and the Church will also be involved. Nigel Dilkes, the vicar of St. Mary's Church in Pilton, is a trained botanist with a special interest in the enviroment and his input will be very much appreciated.. 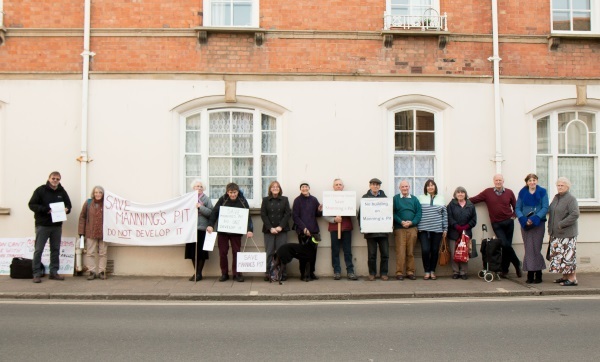 Following on from the news that the Local Plan had been adopted came the news that the 8 week period in which Summix Ltd could ask for a Review into the Asset of Community Value listing had passed without any such request. While we can only guess at their plans, it is likely that they realise they have little chance of getting anywhere with a new planning application for the next five years. 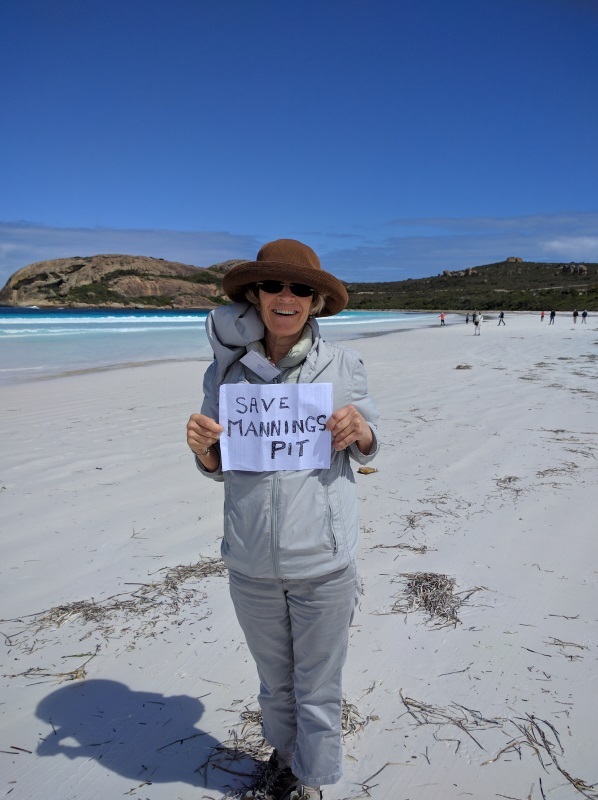 So, as we say repeatedly, we have won several battles, but we have not won the war until Manning's Pit is owned by the local community or an organisation that can be trusted to keep it permanently safe. The way ahead - we will have more to say about that as time goes by, but we are not going to rest on our laurels. 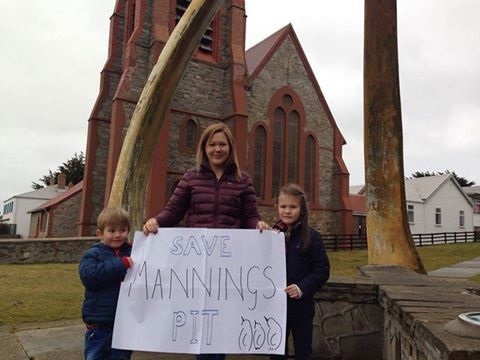 We have more to do to establish Manning's Pit even more strongly as a place of special importance with its environmental attributes, its historical and cultural links and perhaps more than anything its place at the heart of our community. This month we had our Big Autumn Party, which was great fun, and very well attended on a bitterly cold night. It was a chance to meet old and new friends, as usual the amount of food and drink that our supporters produced was quite staggering, and we all enjoyed ourselves. 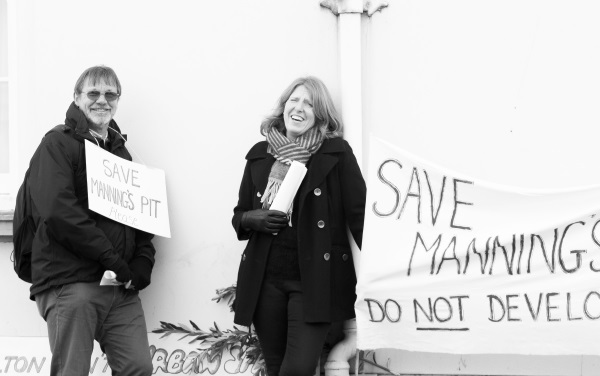 The highlight of the evening was the first performance of Martin Haddrill's new song for Manning's Pit, which is now embedded on our Home Page. 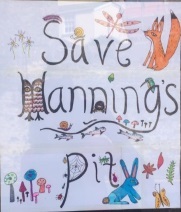 The Inaugural Manning's Pit Poetry Competition closed on the last day of this month, and we are thrilled with the numbers of entries received. They go off to London to be judged anonymously by Julia Bird. The results will be announced on our website and there will be a Presentation Evening at St. Anne's Chapel on Saturday January 12th. Julia Bird will be coming down from London for this event. We have received entries from across Britain, and also some from abroad. 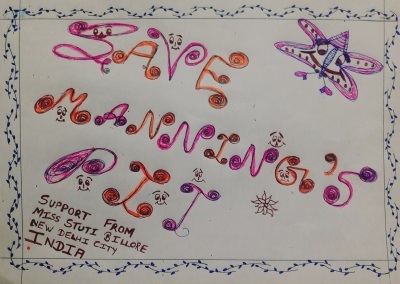 We were especially pleased to receive one from India, from Miss Stuti Billore of New Delhi. 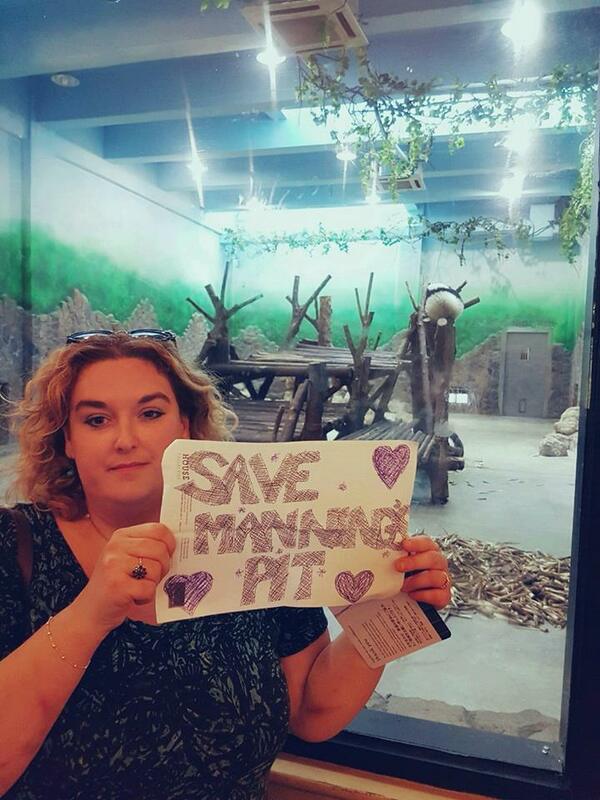 Stuti has become friends with several supporters on Facebook and sent us a most beautiful Save Manning's Pit poster. 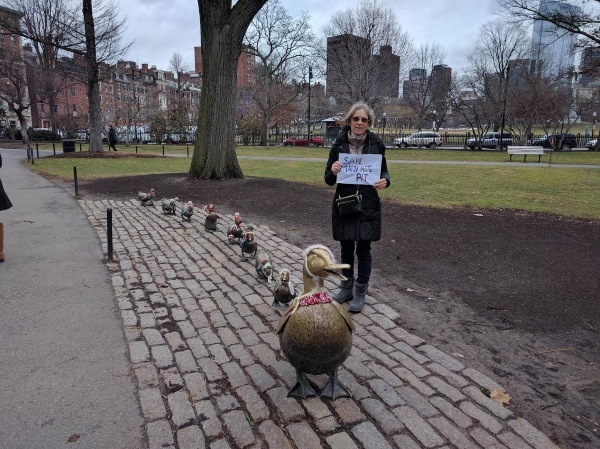 You can see another photograph with a message from Stuti on our Blog here. 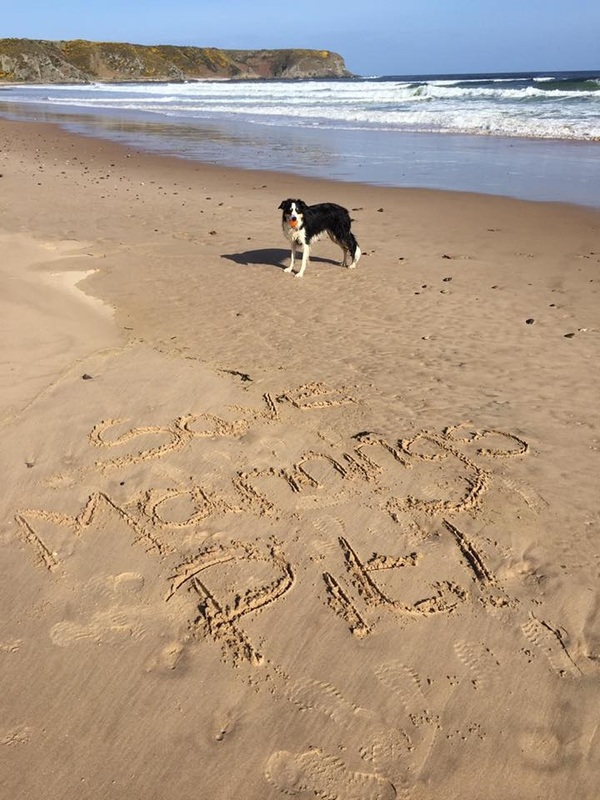 On Monday night, October 29th, the Joint Local Plan for North Devon and Torridge was adopted, which is very good for anyone who cares about the future of Manning’s Pit, which is outside the development boundary. 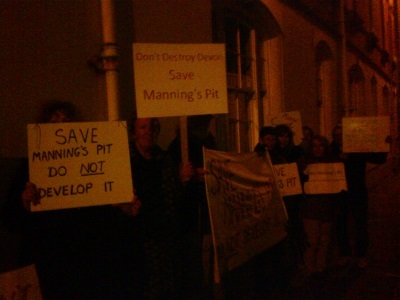 Following on from the listing of Manning’s Pit as an Asset of Community Value, it now has further protection. Entries for our Poetry Competition continue arriving. 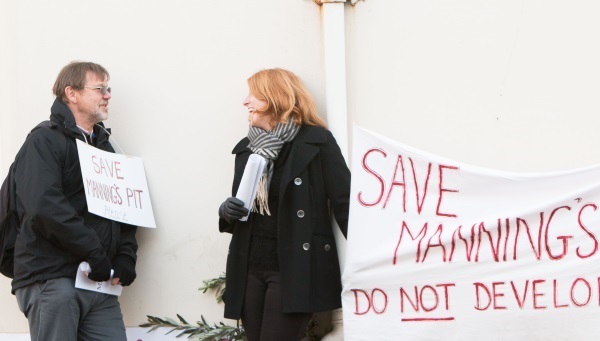 Other exciting news: Sir Richard Eyre signed our petition! President of Rose Bruford College. He has signed our petition and wished us good luck with all our projects. 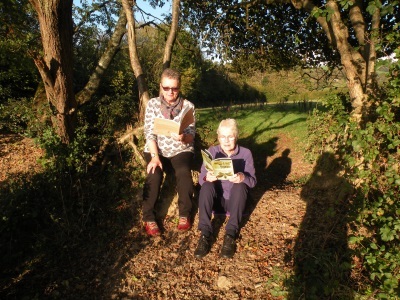 Here are two of our campaigners, Wendy and Kate, reading Julia Bird's books of poetry in Manning's Pit. There is also a good article by Sarah Howells on the North Devon Gazettte website, which also includes photographs from one of our earlier demonstrations. 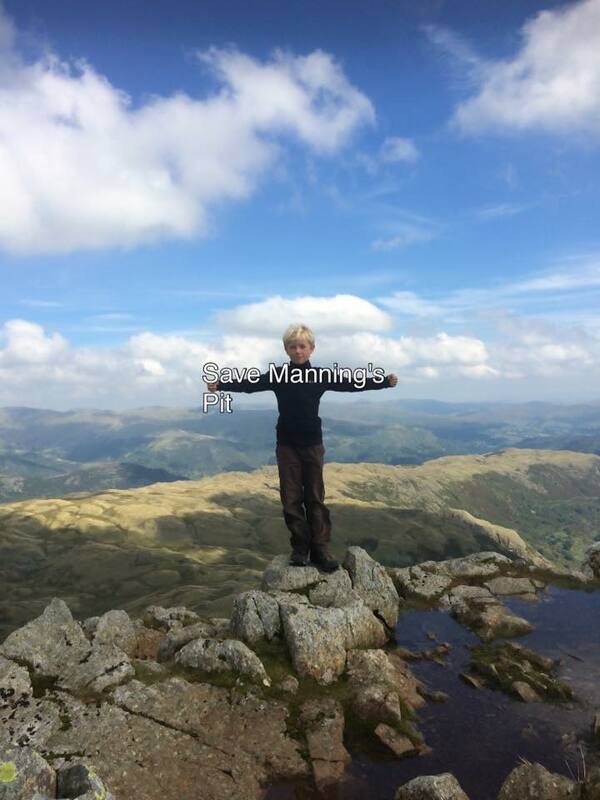 While being listed in this way does not give complete protection to Manning's Pit, it ensures that the owners cannot sell without giving us notification and a six month period in which we can attempt to raise the money for a bid to purchase the land. 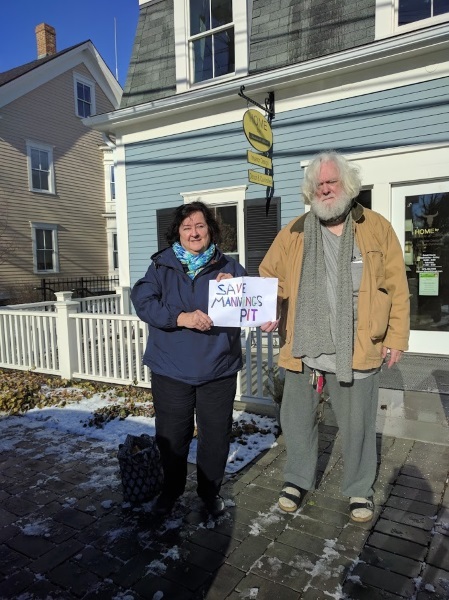 At the end of this time, the owners do not have to sell to us, but nonetheless, this listing is another important step in our fight to save Manning's Pit. The land owners have an eight week period during which they can request a Review of this decision. 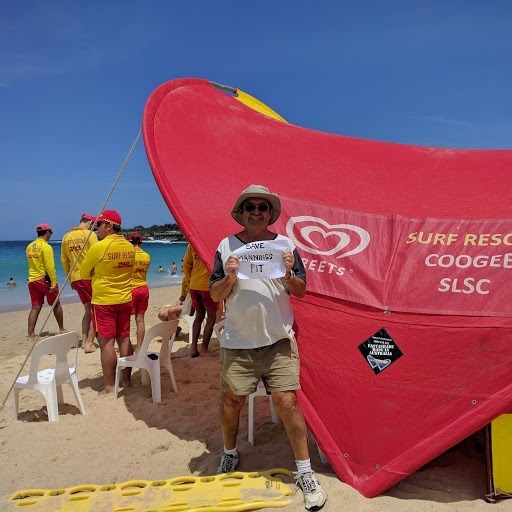 Peter Christie signed our petition. Well known in North Devon most especially for his knowledge of local history, he took part in Shaun Ley's 2016 Radio programme In the Lumber Room that commemorated the death of Saki . He was also helpful to us when we were setting up the Exhibition on the Museum in 2017. 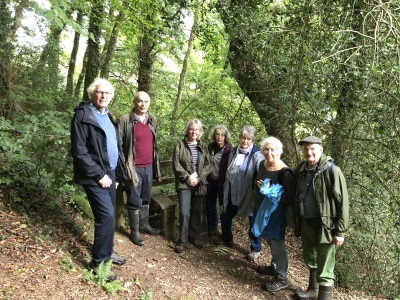 Meanwhile, in Manning's Pit, a number of award winning poets from the North Devon Stanza of the Poetry Society were spotted seeking inspiration before writing poems to enter in our Poetry competition. The Inaugural Manning's Pit Poetry Competition was actually launched on Green Man Day, but promotion intensified in August. 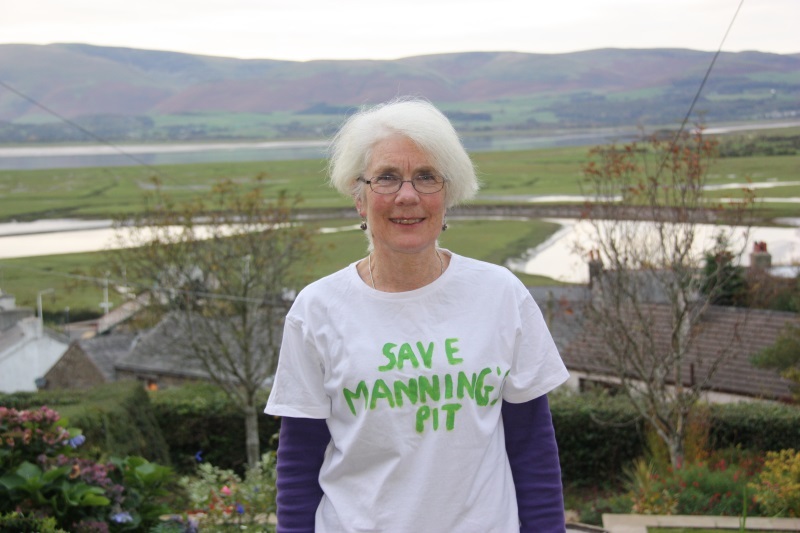 This competition is about raising awareness of our campaign, and poems do not have to be about Manning's Pit, they can be about any similar piece of countryside treasured by locals and visitors alike. 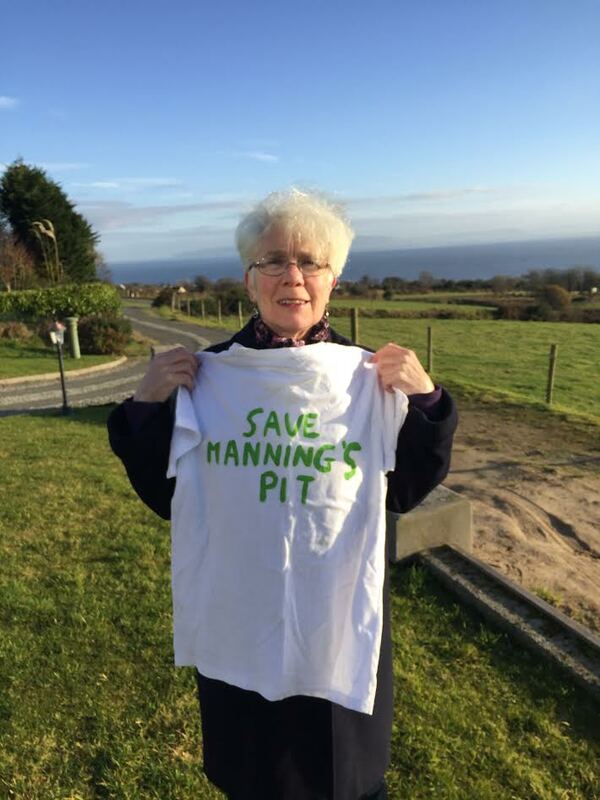 The Judge is the well-known poet Julia Bird, who has been to Manning's Pit and was one of the first to sign our petition, back in March 2016. You can read more about the competition on our Home Page. Manning's Pit bakes in the sun, but it is always a delight to walk in the cooling shade of the river. July in Pilton means Green Man Day, and we had our usual stall outside Mr Manning's old house. We were able to tell people about the Nomination Form we have handed in to North Devon Distric Council, asking for Manning's Pit to be made an Asset of Community Value. We have also adopted a Constitution and our policies are up on the website. Back in April our solicitor wrote to Summix Ltd to inform that we would be interested in purchasing the land. Sadly. we are still - - three months later - waiting for a reply from them..
Our stall in Pilton Street, with the Tree of Love for Manning's Pit at the front on the left. Satish Kumar signs our petition! Yet another celebrity endorsement to add to the many that we have had before. Satish is the Editor of Resurgence and Ecologist Magazine, and most famous for a walk that he did back in 1962, from India to Europe. He has made many media appearances – including Desert Island Discs – and is an author as well. Go to the Blog again to learn more about Satish. Yeo Dale Hotel Banner comes down - for the moment. See the Blog: for photographs of the occasion. We are back in the phoney war stage, which is where we were for much of the last two and a half years. But never mind, we have been here before, and we do not give up! 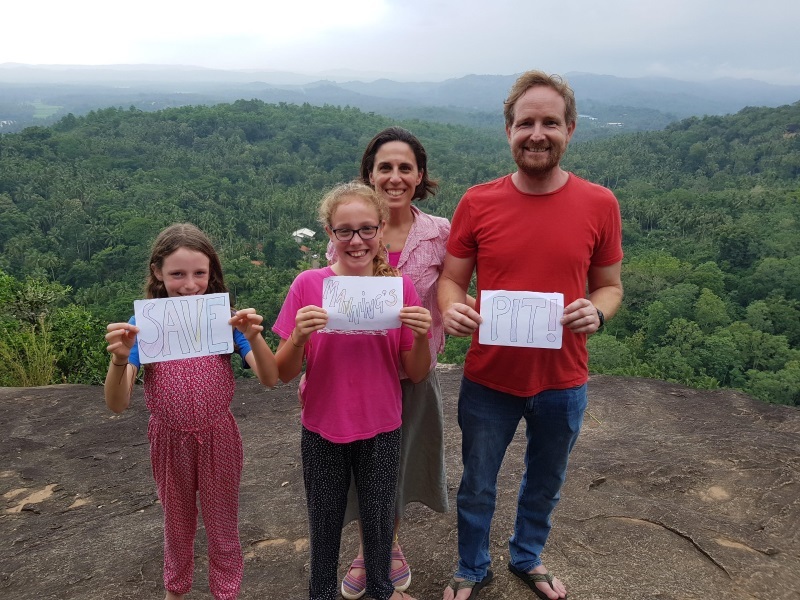 "We went on a river cruise, and floating along the river, watching the swans, and people sitting on the grass in a beautiful park, with Elgar's music as the sound track on the journey, we couldn't help but think how everyone needs green spaces, flowing rivers, wildlife and tranquility, which is what our campaign is all about." We know the battle isn't over, and we know that Summix could come back again with new plans, but we decide to enjoy the moment. The photograph below shows us watching "The Magic of Manning's Pit" on the big screen. Planning Application 62524 has been withdrawn. On Monday March 5th Summix withdrew their planning application. We do not as yet know why they have done this, and we cannot be sure that they will not put in another one, or sell the land on to other speculators/developers. At the same time, this is great news, and we feel we should congratulate all of our supporters in Pilton, Bradiford, Barnstaple and beyond, for making it clear how much this special place means to so many people. There was snow again in March and, as always happens, locals were out in force with theri sledges - on Sunday March 18th they were there from 7am until dusk! The Coffee Morning on February 24th is a big success. 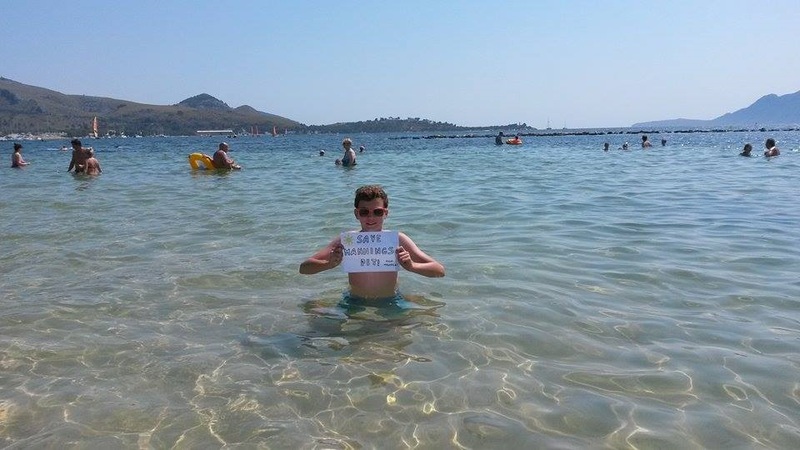 We are excited to learn that that Dr Sandie Byrne, author of The Unbearable Saki, has signed our Petition. 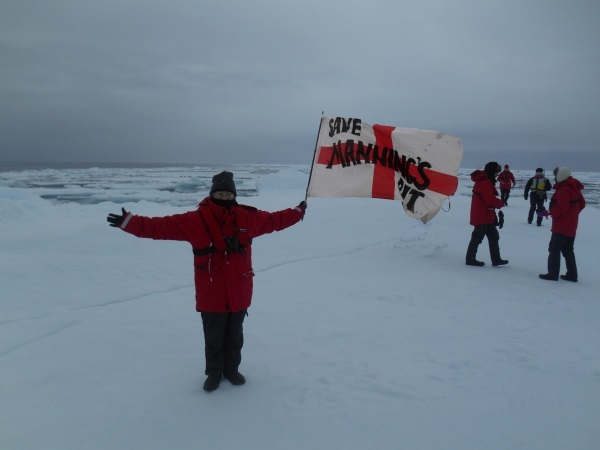 Meanwhile, excitement builds when the weather forecast suggests that we might have snow in Manning's Pit at last. 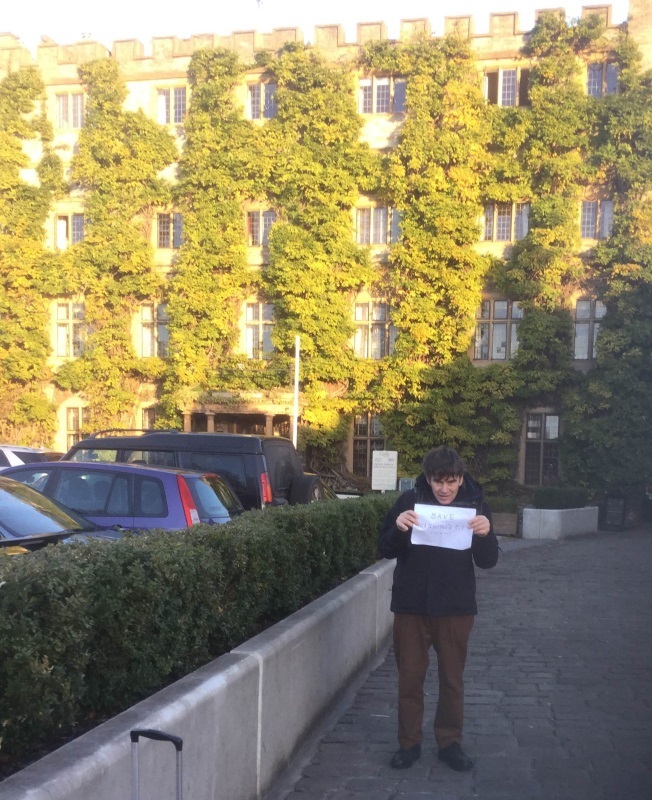 Ken Loach, the famous film director, has signed our petition! That has excited everyone, especially Pilton Cinema supporters, who gave his film "I, Daniel Blake" a standing ovation when it was shown in the autumn. We are so grateful to him for signing. The Planning Meeting will not be in February, so the earliest date it can be is March. 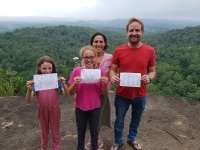 After Iceland, here's a Save Manning's Pit message from a much warmer place : on top of a Buddhist temple in Sri Lanka. We have had a fantastic response to our sudden call for extra funds - despite it being so close to Christmas - and our consultants have produced hard-hitting criticisms of Summix's latest submissions - you can read them on the Home Page.. 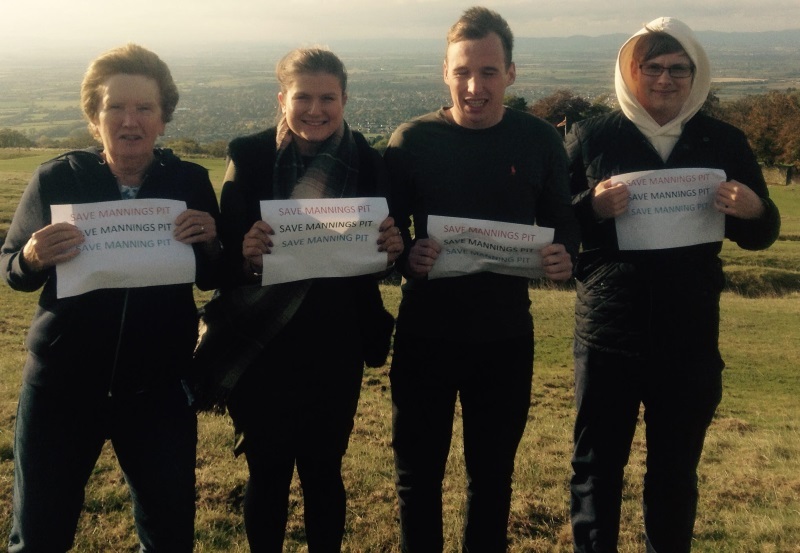 Messages of support from various parts of the country, and the world. continue arriving, and we have had an interesting contact with the Melbourne Public Library in Australia - three paintings by F R Lee were hanging there in 1873 when he arrived in Melbourne on his yacht Linda. Still waiting... but we had our latest Coffee Morning, which was a great success. It was good as well to make contact with people who have moved into Pilton recently. As the campaign has carried on, some of our supporters have had to move away, but the new people who move into their homes have in nearly all cases demonstrated their support as well. It was a privilege to meet with Richard and Anne Williamson at the beginning of the month at a book launch in Bideford, and we now have a copy of Tarka the Otter signed by Henry Williamson's son himself. Richard Williamson is also the grandson of Sarah Hibbert who used to live in Broadgate House and was herself the daughter of the famous Victorian artist Frederick Richard Lee. 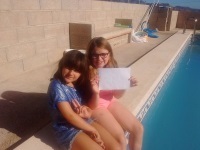 Messages from abroad keep on coming, this one was from two Pilton children, on holiday in Spain. 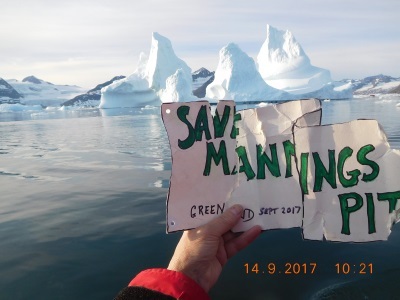 From the jungle to the icy North... a late September Message came from Greenland, along with photos of polar bears as well. The wait continues....meanwhile we continue having messages from abroad, especially one from the Costa Rican rain forest, and our online petition now has 3017 signatures. This is a large number for a campaign focused on a small local piece of land. 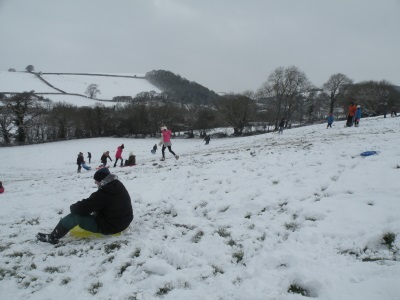 The population of Pilton is only about 5000, and that number includes children and elderly people in residential care. Also, as we discovered while doing our house to house survey, quite a large number of people in our community prefer not to sign online - we have a paper petition as well for those people to sign. 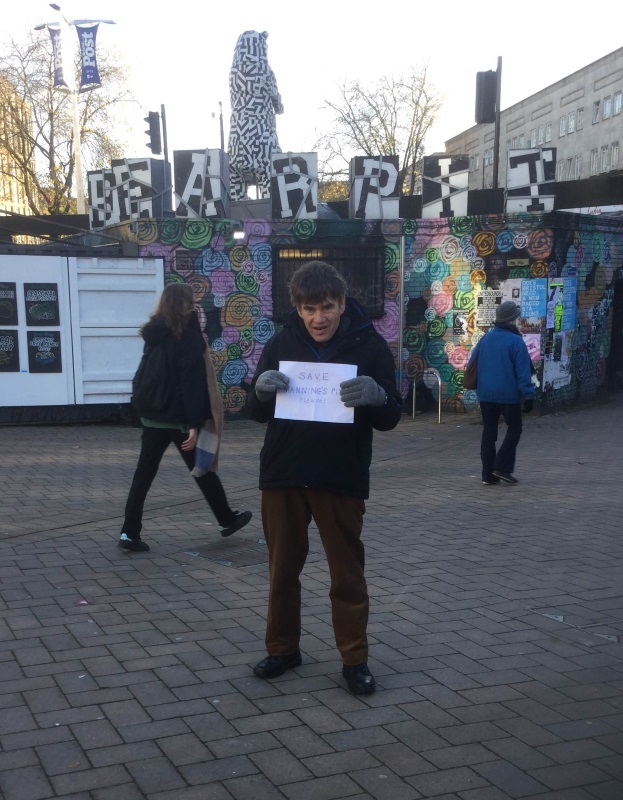 Meanwhile, we have had more messages from abroad and other parts of the UK, go to our blog to see photographs of them (especially ones from Uganda) and the Green Man Festival. 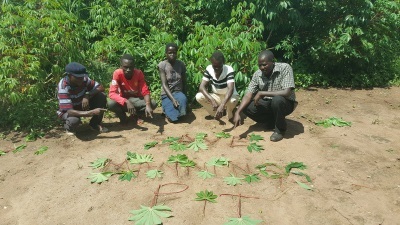 Save Manning's Pit message written in Cassava leaves, from Uganda. 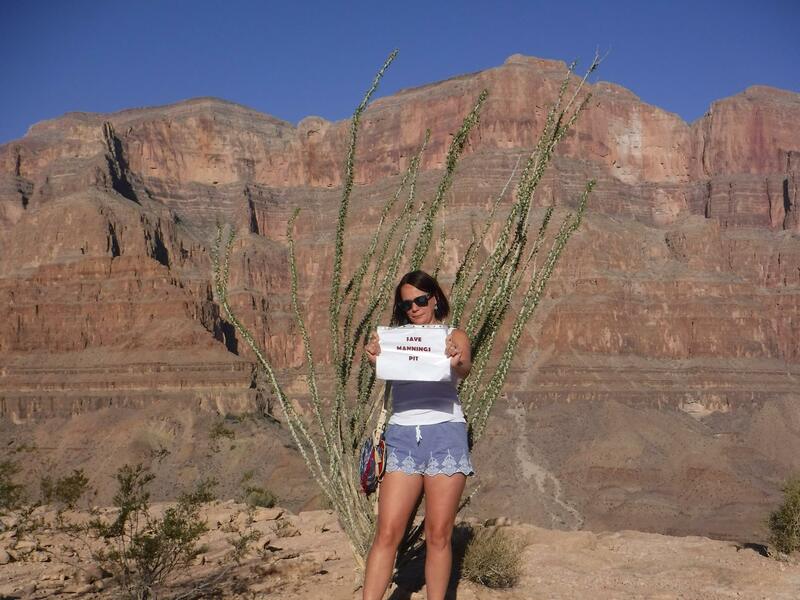 Photo taken by Acomo Lovelock, who has also walked in Manning's Pit. We are waiting now to hear when the date of the Planning Committee will be, and as son as we have some information about this we will post it on the Blog and Facebook. In the meantime, we will once again have a stall at the Green Man Festival, so we hope you will stop by to say hello if you come along. We were very sad to learn that Trevor Beer has passed away. 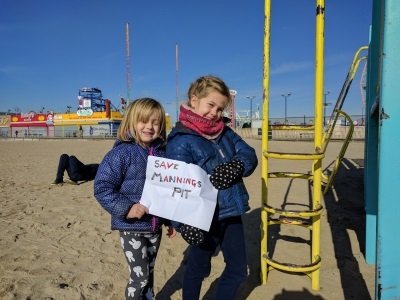 He supported our campaign because Manning's Pit was important to him, and we now have an extra reason to make sure that he did not support us in vain. And also a link to a letter he wrote to the North Devon Journal back in 2015. We are non-political and have supporters from all parties, so want to make clear that no particular party represents us in any way. Before the election, each candidate gave us a statement about their position on Manning's Pit, which can be seen here. We were pleased that they all gave us statements of support. The Exhibition continues until May 20th. 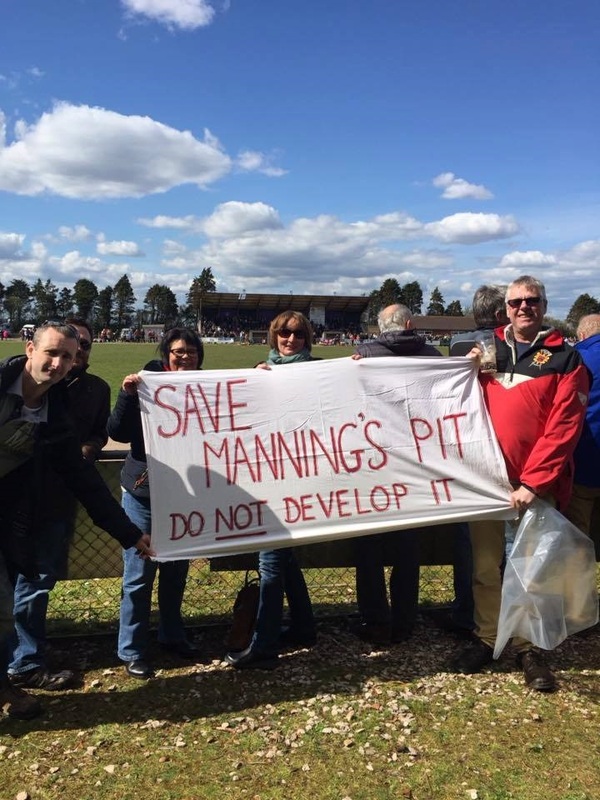 We are now waiting to find out when the application to build on Manning's Pit will come before the North Devon Council Planning Committee. Consultation Period closed March 16th. You can see our consultants reports on the Home Page. The response from local people was tremendous, over 250 letters of objection were received, and can read on the Council website. The phoney war is over, the application is in. 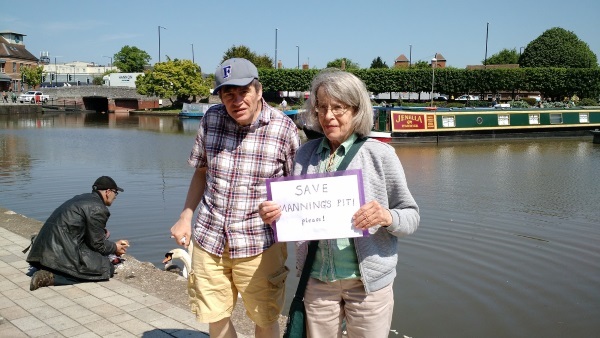 Perhaps it is Round One to us, and the speculators who bought the Manning's Pit fields have been intimidated by the enormous level of public resistance to the plans displayed in their Exhibition last year. From an original suggestion of 138 houses they have now put in plans for 41. 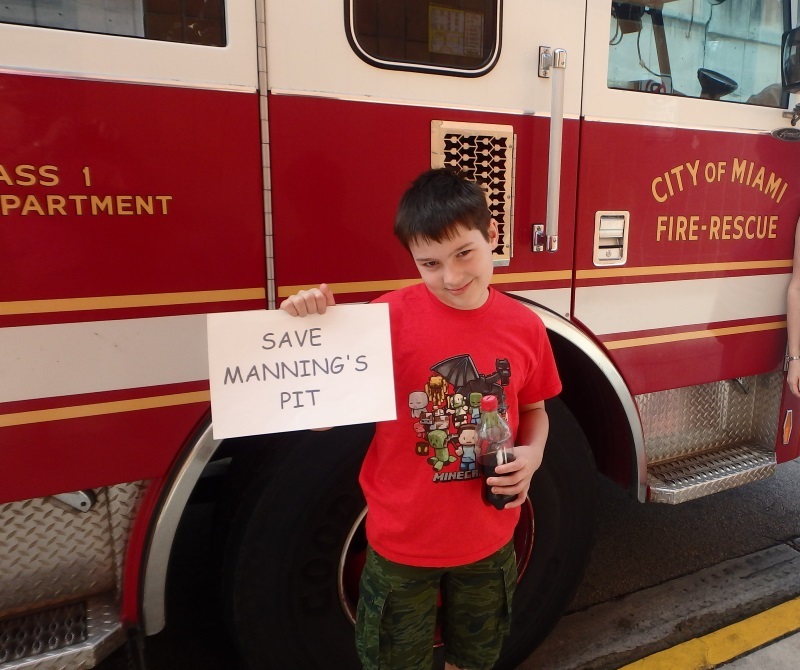 Make no mistake, though, these plans would mean the destruction of Manning's Pit. They strike at the heart of this magical place that we all love so much, they would drive a road right though the buttercup fields that delight us all each spring, carve out earth from the slopes and change the very shape of the field, where generations of Pilton and Bradiford residents have walked and played. 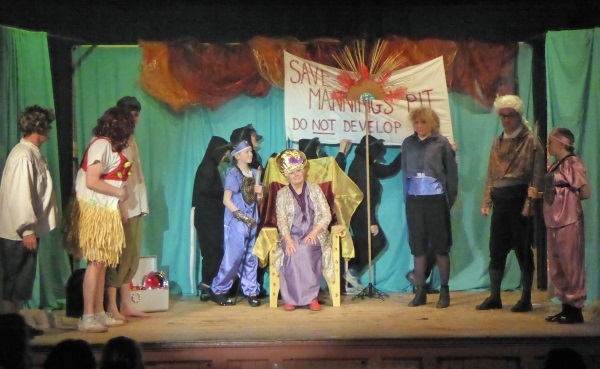 How appropriate it is that in the week that the plans are made public, our Save Manning's Pit Banner is playing a prominent part in the popular Pilton Pantomime. Manning's Pit is our Hampstead Heath, our Primrose Hill, our Central Park, our special place, and we will do everything in our power to keep it safe. Go to our Planning Application page to find out how to object to these plans. 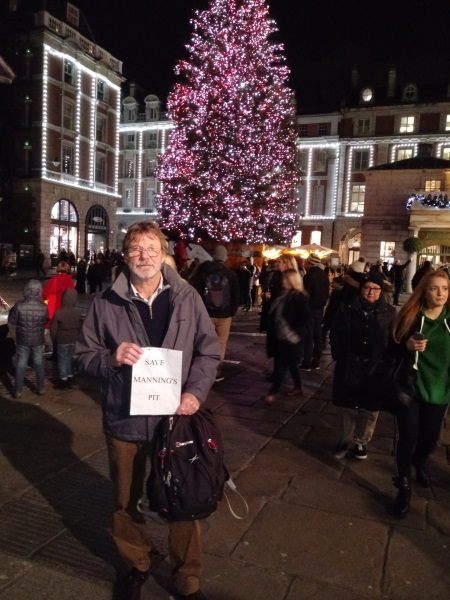 We are thrilled to have received a message of support from Michael Morpugo, the former Children's Laureate, founder of "Farms for City Children", and writer of "War Horse" and many other wonderful Children's books. 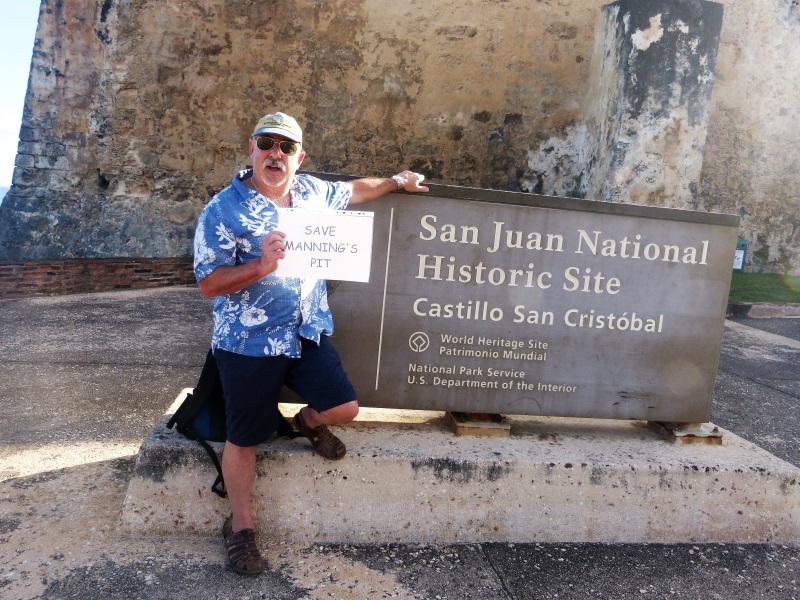 He said, in a card received this week, that he supports our " brave and important effort to stem the tide of intrusion into our precious places." John Norman and Harold Murch, who both played in the Manning's Pit fields back in the late 1940s and early 1950s, visited Michael Morpugo recently. Harold Murch has connections with the Farms for City Children (he has taken children from Birmingham down to the farm.) John is of course one of the stars in our film "The Magic of Manning's Pit." 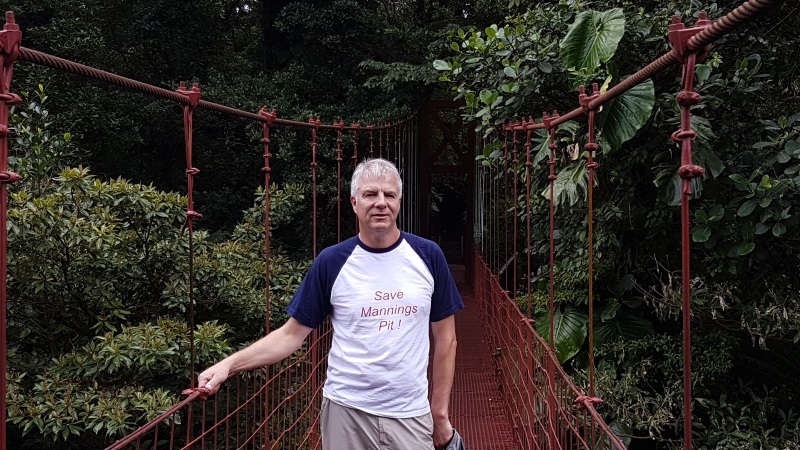 Their visit inspired us to write to Michael Morpugo, and we are delighted to have his reply, to add Literary support to the support we have had already from environmentalists James Lovelock and Jonathon Porritt and - locally - Trevor Beer. We like to feel that we can call Manning's Pit "Fields for Town Children" because that is what they are - a place where children in our town can play in real countryside and be in touch with their rural heritage. Manning's Pit also has important Literary links because of the fact that Saki, the world famous Short Story writer, grew up within sight of Manning's Pit. Interestingly, there is another kind of Artistic and Literary link to Manning's Pit through the daughter of the famous Victorian artist Frederick Richard Lee. He lived in Broadgate House, which was just across the road from Saki's house, and his daughter became friendly in later life with Henry Williamson (Tarka The Otter.) He dedicated one of his books, The Village Book, to her. 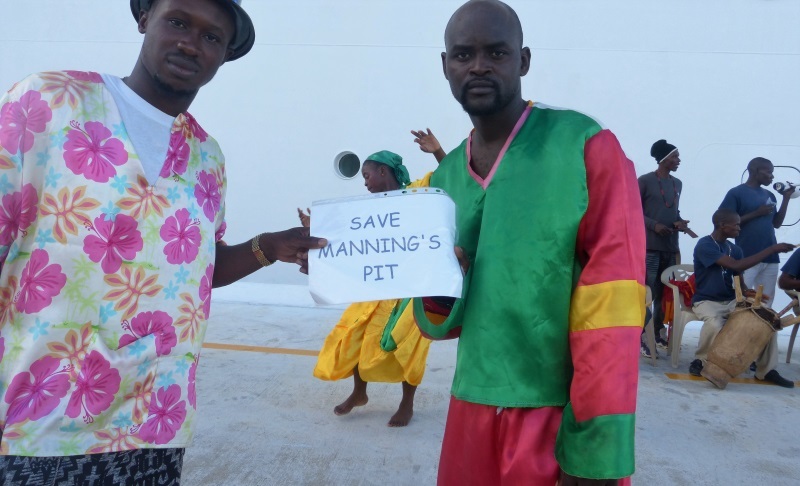 The Second Manning's Pit Art Exhibition. 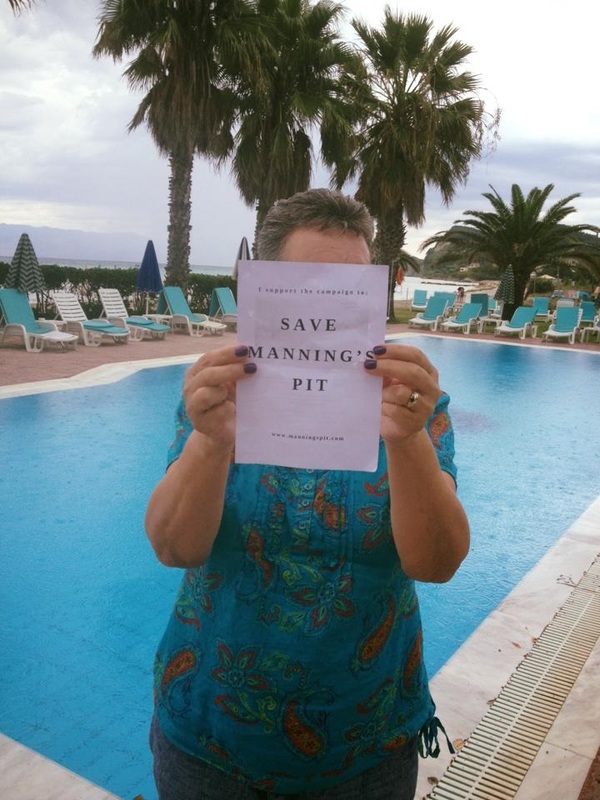 When we held our first Exhibition a year ago, we were still in the dark about whether the option on the purchase of Manning's Pit would be completed. Only a few days later the news came that it had been been. Little did we imagine then that a whole year would go by without a planning application being submitted, although of course one could come in at any moment. Last year we had five artists exhibiting - this year we had more than double that, and all who came were impressed with the quality of the work on show. More than anything, the paintings demonstrated the love that all the exhibiting artists feel for this most special place. The Children's Competition was a great success, and as, with the adult work, the children showed how much they cared for Manning's Pit. There were three age groups, and while one of the most favourite subjects was the rope swing, many of the works submitted demonstrated careful observation and a feeling for the landscape. Peter Heaton -Jones, the MP for North Devon, presented the prizes to the Children on Saturday morning, and spoke in support of the campaign to the assembled group of families and visitors. 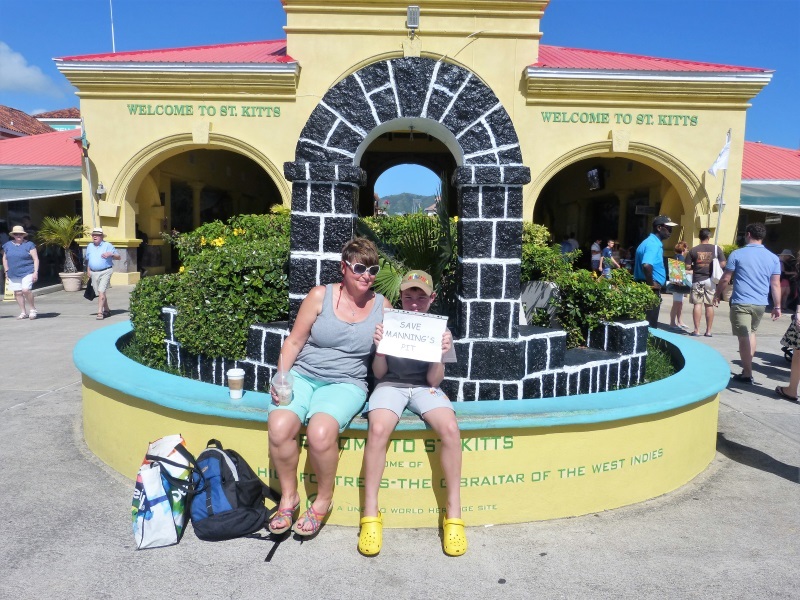 He said how impressed he had been by the number of window posters and signs on display in Piton as he walked to the Hall from his car. This was interesting as he did not know that there were fewer up than normal as many have been temporarily taken down, either to make way for Christmas decorations or because they were faded and needed refreshing before going up again! In the photo below - Peter Heaton-Jones, MP for North Devon, presenting his prize to Dylan Knox Bulpett, winner of 1st prize in age group 6-11. 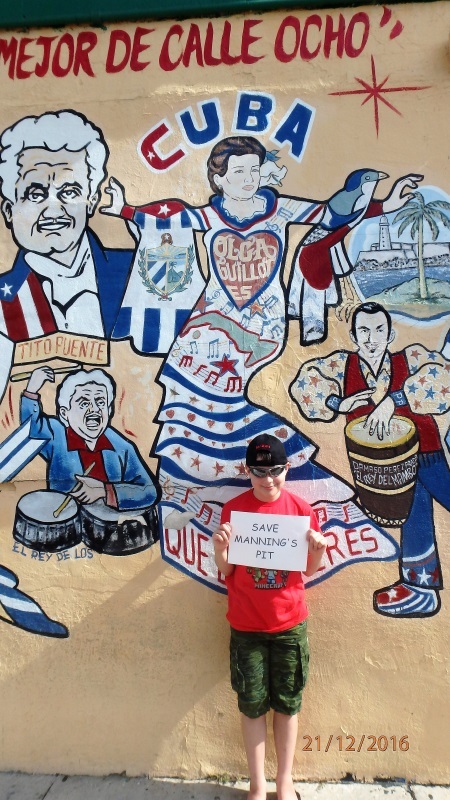 Also we have had more Save Manning's Pit messages from abroad including Boston, Coney Island, New York, Miami and Little Havana in the USA as well as Puerto Rico, St. Kitts and some dancers on a beach in Haiti. We haven't quite covered the whole world, but we are not doing badly, considering how small Pilton and Bradiford are! There remain a few gaps, and we are hoping for messages from Africa, Russia and South America this coming year. One of our supporters was in Antarctica in the spring last year, but set off before we had the idea of asking people to send Save Manning's Pit messages back! If you find a photograph missing on the map, let us know - for some reason they sometimes vanish again after they have been uploaded safely. We remain, as we have been since March 2015, in what we call a phoney war situation. 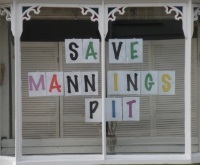 The London-based speculators who bought Manning's Pit have yet to put in a planning application. One could come in at any day. 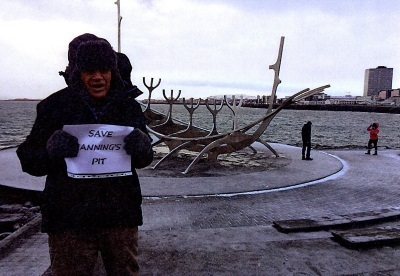 Save Manning's Pit messages continue arriving from all over the world. 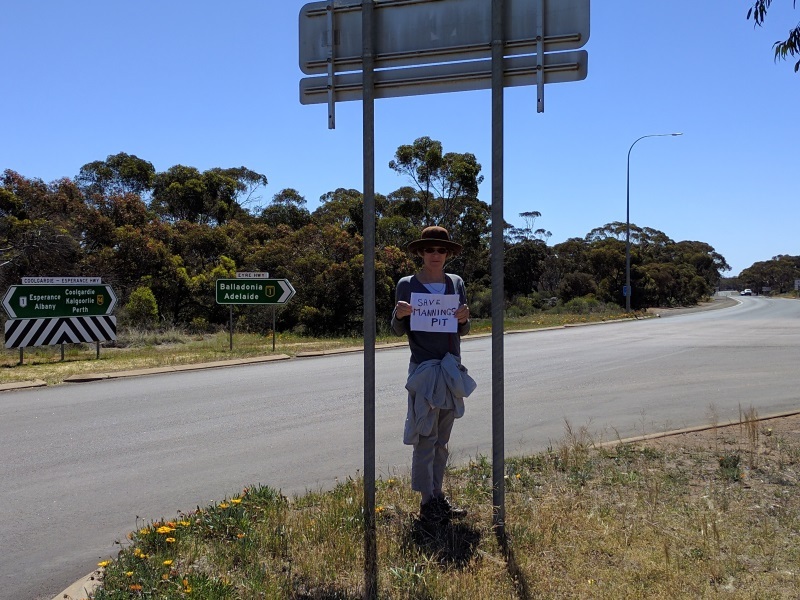 In recent weeks we have received a number of messages from Australia, including one from Graham Manning of Coogee, NSW, some from Cumbria, from Cleeve Hill, Cheltenham, from Bristol, including one from the Bear Pit, from Taunton, from the Republic of Ireland and the Giant's Causeway in Northern Ireland, and Acton, Massachusetts,USA as well as the beautiful one above from two very special Pilton children visiting Father Christmas in Lapland. And we must mention this message that comes on the back of Gordon, who lives in Pottington, Barnstaple, and runs round Manning's Pit. The Youing's Drive application is approved. This is a very different piece of land from Manning's Pit as it is inside the development boundary, but it was purchased by Summix Ltd, who also purchased Manning's Pit. 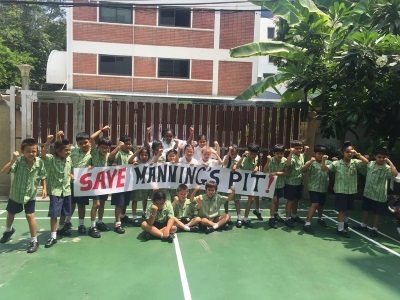 It is nearly a year since the Manning's Pit fields were sold at auction. A planning application has not as yet been submitted although of course it could come at any moment. As soon as it does so we will inform you of any action that you can take to help. Meanwhile, we need to raise funds to commission expert help to fight an application. If you can help in any way, either by donating, or pledging support for when the time comes, please contact us by email: manningspit@gmail.com. 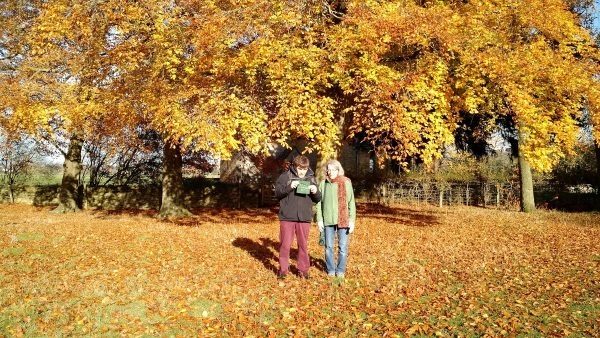 John and Mary Breeds came to do a Moth Survey on Sunday September 11th Their enthusiasm for all forms of wildlife and plants is inspirational and we are so grateful to them for coming along to do this for us. A select group of supporters joined us as the surveys were set up close to the Manning's Pit bridge, and we were all fascinated by the moths and insects that we saw. Tim Saunders was so inspired that he wrote a poem! The Breeds run wonderful wildflower walks on Braunton Burrows on summer evenings and several of our supporters have been along on them and can highly recommend them. We have messages of support from a Chinese Panda Sanctuary, from the Grand Canyon in Arizona, Spain, Majorca, the Lakes, Corfu in Greece and other holiday destinations. See them all on our map and Facebook Page photos. The Phoney War is not in fact over, despite our previous post below. 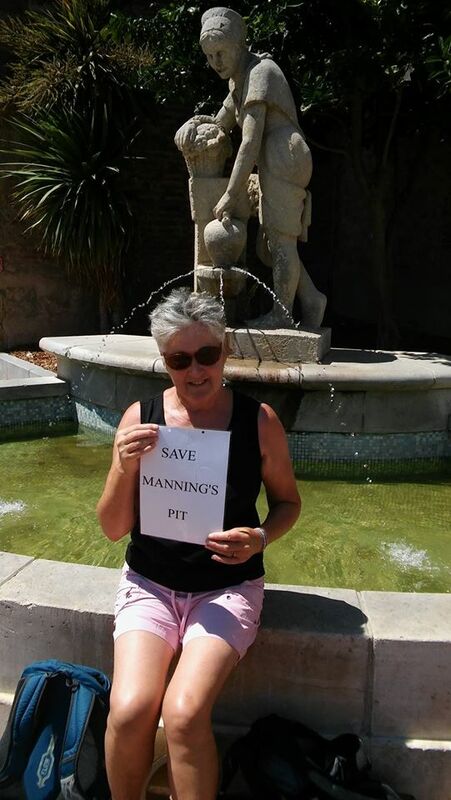 The speculators who have bought Manning's Pit have not yet put in an actual planning application. We have no idea when it will come, although we do know that they have been doing various surveys in the fields. 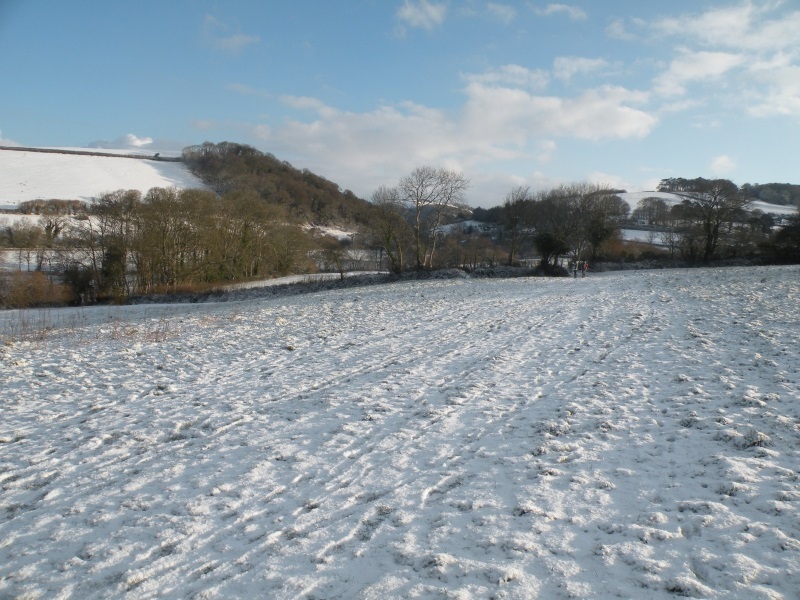 What we do know is that support for our fight to keep these fields safe for future generations to enjoy has grown and grown, both locally and further afield, as the map of messages and posters, and the petition both demonstrate so vividly. 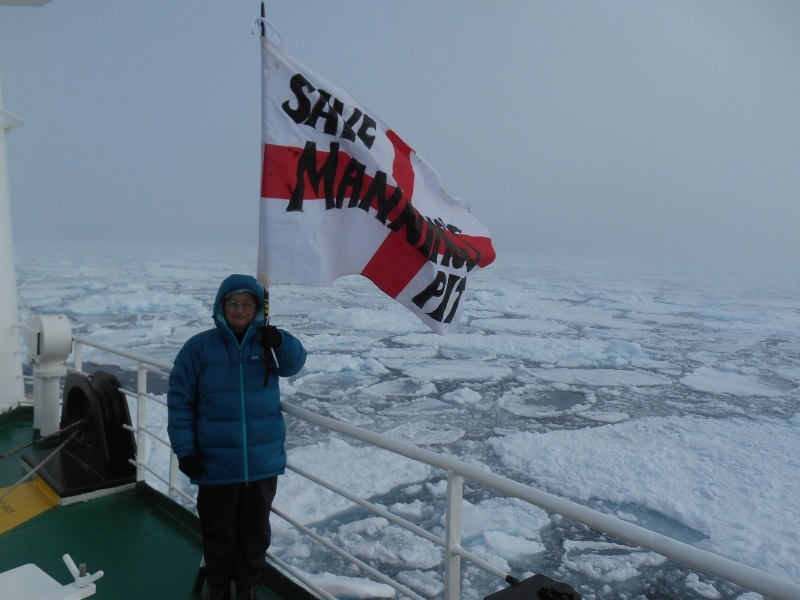 Supporter Clare waves a Save Manning's Pit flag on the Arctic ice. 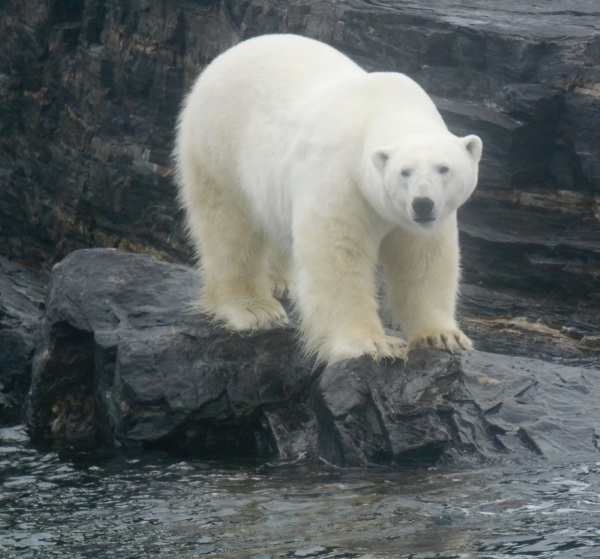 See more of her photos of the Arctic here, including polar bears - a real danger while picking up plastic rubbish on the ice. 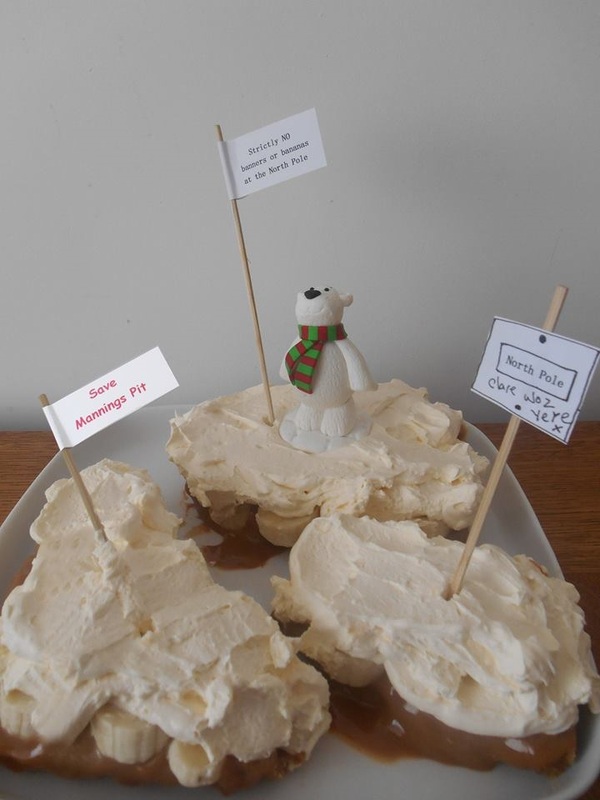 On her return, another Manning's Pit supporter baked this in her honour. As news of the film, petition and posters spread, people from further away began to send us messages too. 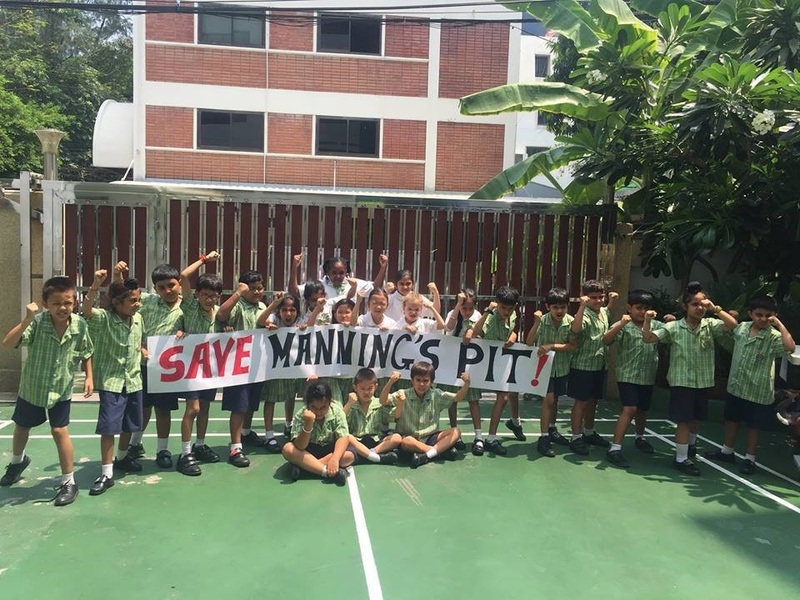 It was notable how many people who signed the petition lived in other parts of the country or abroad, but said they had played in Manning's Pit as children. They cared enough about it still to write to us. Peter Heaton Jones MP and Environment Agency Chief Alan Burrows visit Manning's Pit, report includes a video of Peter Heaton Jones and Christine Lovelock (Friends of Manning's Pit) speaking about Manning's Pit..
Springtime brought more than flowers to Pilton and Bradiford. It began slowly, with one or two window posters and signs, and then they began sprouting everywhere, to become the talk of the town. 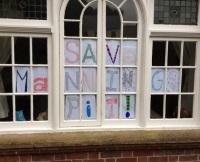 The Phoney War is over - The Second Battle of Manning's Pit begins. We finally discovered who the new owners are, property speculators with head office based in London, called Summix Ltd. 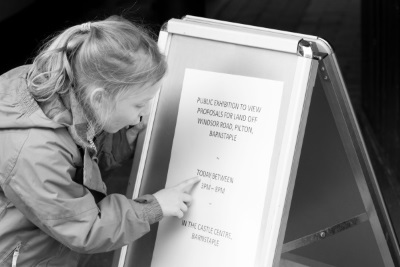 The Public Exhibition was held by Framptons (agents for the new landowners) on Monday 21st March at the Castle Centre, 25 Castle Street, Barnstaple, EX31 1DR, from 3pm - 8pm. Little did they know it was also going to be the venue for the launch of Martin Kemp's wonderful film "The Magic of Manning's Pit" - see the film embedded on the home page. 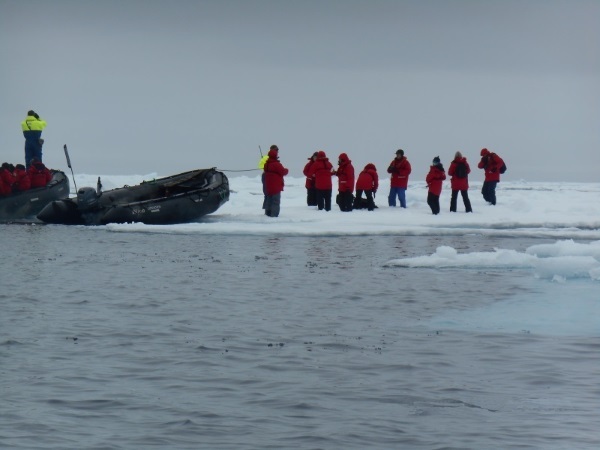 Below are some photographs from our marathon 5 hour long decoy demonstration. It was designed as a relay demonstration but some noble supporters were there the whole time. It was a real demonstration but one of its aims was to mislead. Framptons had no idea at all that we had hired a room in the Castle Centre, and there was about to be an alternative and far more alluring attraction in opposition to their Exhibition! The Press and media came and took lots of photographs, at the beginning, when there were far more people, but we had no chance to take any ourselves, so a special thanks to Tony Hebblethwaite, who came at three, and later again, and took most of these photographs. Five pm on the pavement opposite the Castle Centre, in full view of the Framptons Exhibition. Five pm, on the pavement, two of the local people who spoke so movingly in "The Magic of Manning's Pit"
If you listen to The Voice, our local Radio station, you may have heard Chris Bulpett (left) being interviewed the next day. And if you listen to Radio Devon you may have heard Tim Saunders, second right, speaking on Wednesday morning. Around 6pm, or perhaps later, taken from a phone. 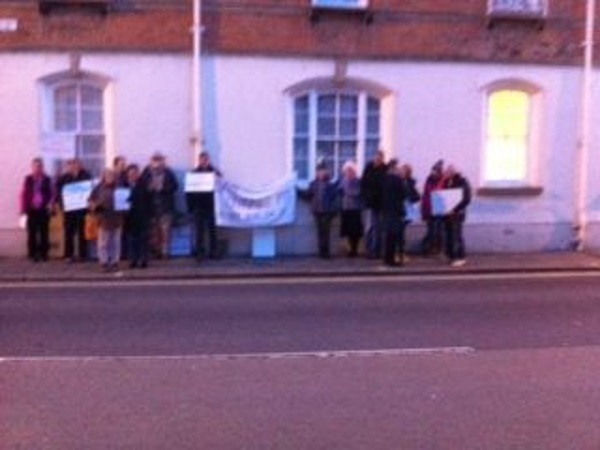 It was getting much colder, but our supporters did not give up. 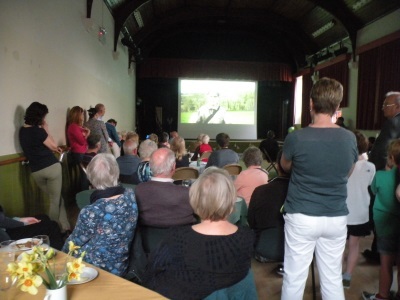 This final photograph (from his phone) was taken by Brian Greenslade, who had been away but came just in time for the last showing of the film. 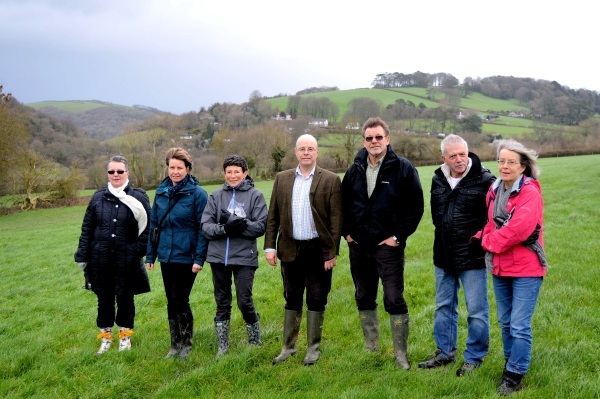 North Devon MP Peter Heaton Jones meets members of our group and walks around the fields. The news came at the end of January - after rumours to the contrary - that the new owners had indeed taken up the option on Manning's Pit. It proved difficult to find out who they were. 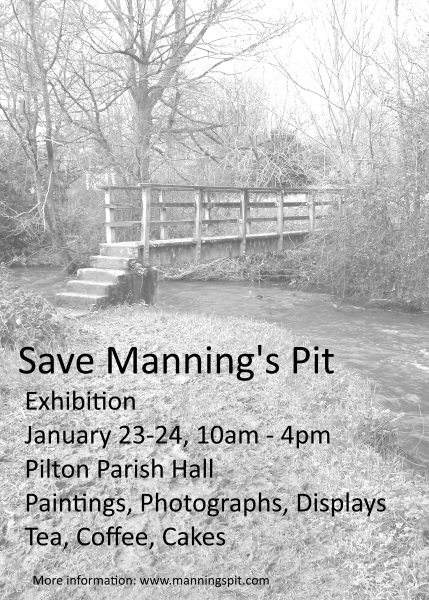 The Exhibition about Manning's Pit, that was held in Pilton Parish Hall on the weekend of January 23rd and 24th, was a great success. Thank you to all of those who came, we were very pleased to meet you all. The Exhibition included paintings and sketches of Manning's Pit and the surrounding fields by artists Tim Saunders, Zsuzsa Reynolds, Ann Beer, Margaret Reed and Christine Lovelock. There were also many photographs on Display, plus maps and information about the fields that are under threat. 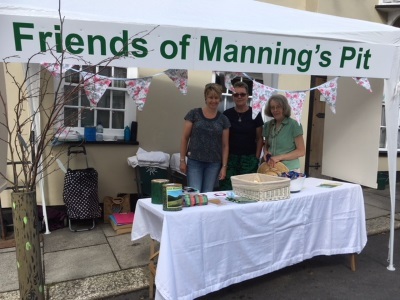 Another part of the Exhibition was a section on the History of Manning's Pit, and included a display of photographs from the Pilton Archive, and information Benjamin Manning himself. We are especially grateful to Margaret Reed for the time she spent researching his life for us. Thanks also to all of those who made cakes, and helped generally, whether with teas or setting up the Exhibition. "Rally and March for Manning's Pit" in the centre of Barnstaple, Saturday December 19th, 2015. 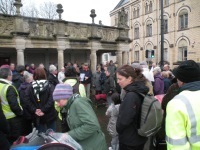 A great crowd of people from Bradiford and Pilton came down to support this event, despite heavy showers, gusting winds, and all the pressures of this being the last weekend before Christmas. While rushing around we also managed to take some shaky photographs, and also to record some interviews afterwards with the attending local politicians, which are embedded below. While we are non-political, we are grateful to have support from local politicians, some of whom came to join us yesterday. They all said they were impressed by what was described as an amazing turn out. in the circumstances (bad weather, busy time). 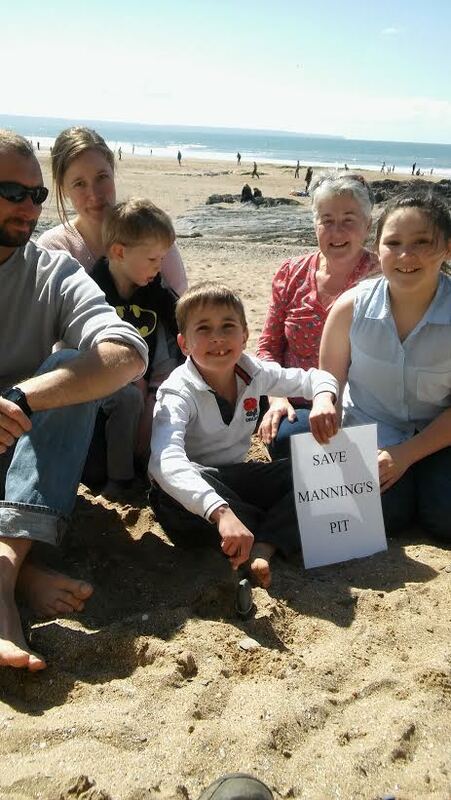 Letter to North Devon Journal about Manning's Pit, from Trevor Beer, MBE. 113 people gathered, in bad weather, at very short notice - which is why few people had time to make placards. 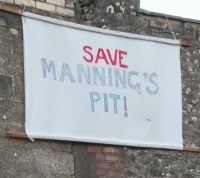 The news in September that the Manning's Pit fields were for sale were a shock to almost everyone in Pilton and Bradiford. 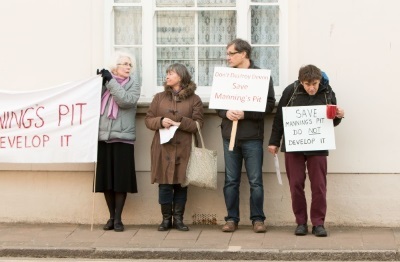 The Pilton Residents Group had been fighting for several years to stop other building developments, without success, and they said they could not fight to save Manning's Pit. 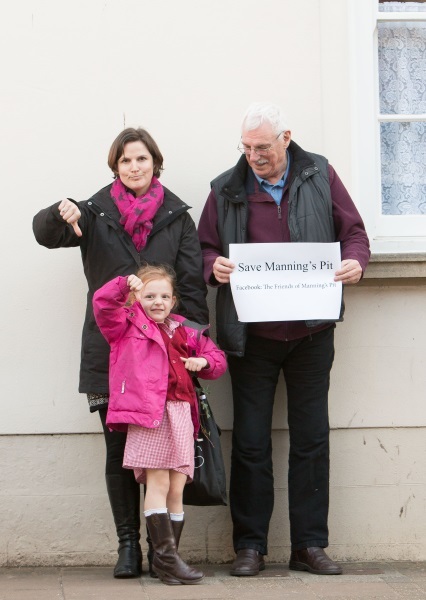 The Manning's Pit fields were outside the development boundary, and special to the whole community. Someone had to do something. 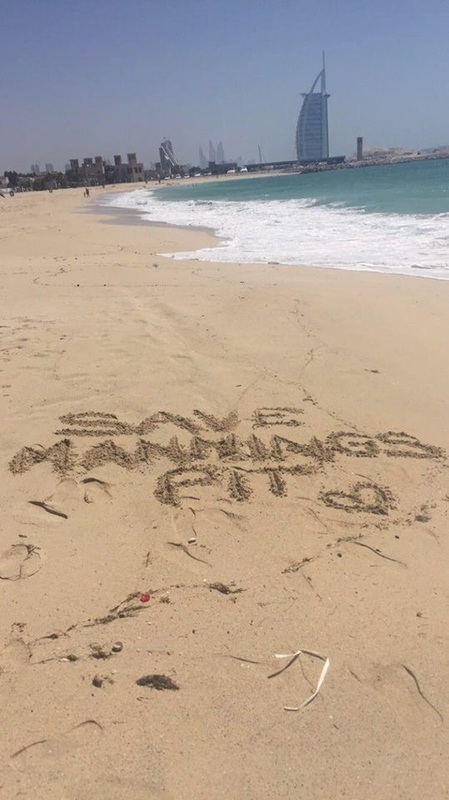 On Wednesday October 7th The Friends of Manning's Pit was formed as a group, and a Facebook Page was set up. but there just wasn't time - with the level of expertise that we had - to raise the money and organise everything for a full bid before the Auction on October 27th. Estate Agents Stags had persuaded the owner to change the conditions of the Auction, so that rather than be open to any bid, whoever bought the other smaller plot that he was offering for sale (about 4 acres, behind Youing's Drive and inside the development boundary) would have the option to buy the larger Manning's Pit plot (four fields, over 26 acres) for £250,000. 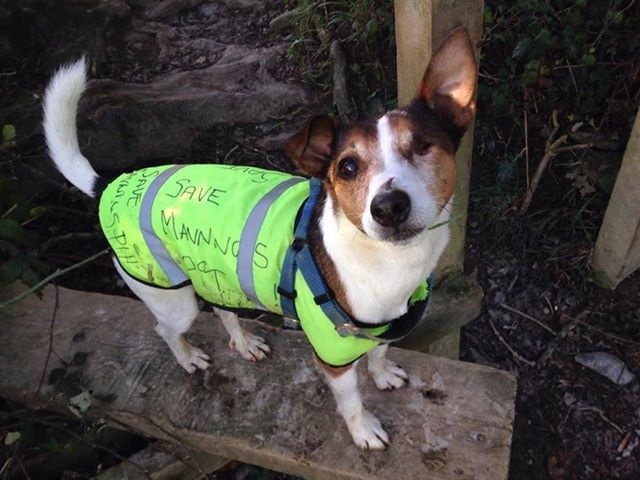 Having made contact with the owner, and raised enough to cover the deposit, we still had hopes that this option would not be taken up but sadly it was. The new purchasers had a three month time limit to complete on this option, so we were still hopeful that they might pull out.